Here is one of the most useful devices to which the handy man can give his attention. It is very rarely that a housekeeper can cut even and handsome slices of bread, however much she may desire to have the bread plate look attractive. One slice will be thin, another thick, while another will be thick on one edge and thin on the other. The drawing shows a simple arrangement by which all the slices of bread can be cut of an even thickness without any slant. Cut a piece of pine board to about 9 x 13 inches. Near one end, on either side, insert firmly two pieces of very stout wire, bent double, as suggested in the cut. These wire supports should be at least 7 inches high, and should have another inch of length firmly inserted in the wood. The wire should be as stout as No. 12, or larger still, and should stand exactly at right angles to the board. Put them far enough apart so the largest loaf will readily go between them, and have the opening in each wire standard just wide enough so the knife will slide up and down without "wobbling." The dotted lines show the position of the knife when in place. Screw a little strip of wood in front of the wire, just far enough ahead to make the slice of bread the right thickness. Press the loaf up against this guide and cut off a slice, then press the shortened loaf up again, and repeat the process. It's a mighty nice thing to have a good supply of cold water at the barn when threshers, corn huskers, or hay harvesters are at work. A simple and effective arrangement can be made by using a flour barrel and a 10-gallon stone jar. Place the jar inside the barrel and surround it with charcoal, sawdust, or chaff, if nothing else is available. With a tight lid and a wet cloth spread over the top, water will keep ice cold in this arrangement. The uses of such a cooler may be multiplied to include keeping many things cool in the house. 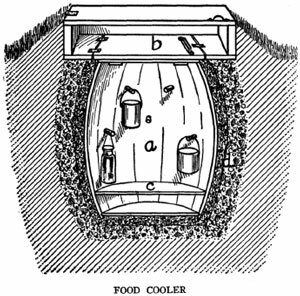 A very convenient and serviceable place to keep dairy products may be formed by sinking a large barrel in the ground. A shady spot should be chosen, or the heat of the sun will affect the temperature. Fill in around the barrel with small stones, gravel and sand, dampened in order to maintain coolness. Construct a box around and above the top of the barrel, and bank up with solid earth, preferably clay. This drains off the water when it rains. It also makes the bottom of the barrel farther down from the top of the opening, which further promotes coolness. Next shape a light, inner lid to place on top of the barrel, and then make a strong, hinged lid for the box, and arrange it so it may be fastened down tightly. Sprinkle a little dampened sand on the bottom of the barrel, and your little barrel cellar is ready for use. By being careful several vessels may be arranged one above the other in this handy little receptacle. Air out occasionally to prevent mold and odors from collecting. Where a deep, cool well is located near the house an arrangement may be devised that will serve the purpose of a refrigerator. Construct a frame of strong boards with a groove in which a board on the side of the box of shelves can run. Attach a rope to the top of the box of shelves, pass it over a wheel on the crank shaft and balance with a counter weight. If the frame is 16 feet long and extended down near to the surface of the water the lowest temperature may be secured. A nice looking top may be constructed for the arrangement, with a door opening into the shelves when they are drawn to the top. Most wells are almost as cool as a refrigerator, and this sort of an arrangement serves the purpose with a great deal less expense. A wire clothesline will serve as a cable. Any old pieces of iron will do for the counter weight, and it is well to have a ratchet wheel, such as are found on old chain pumps, to prevent the elevator dropping when it is well filled. Make as many parts as possible of wood to prevent rusting. One such elevator is 42 inches high and 18 inches square. Turning the grindstone is hard work; but if you use it as a muscle developer it will help out. When the housewife has baked a pie or a pudding for dinner and wishes to cool it quickly in winter it has to be set out of doors; but there the trouble begins. It cannot be set upon the snow, since that would melt and engulf the hot dish. Moreover, the cat or dog, or some neighbor's cat or dog, is likely to be lurking about the door, ready for pie. Let the handy man make a little out-of-door cupboard for the use of the housekeeper, locating it beside the kitchen door. Get an empty grocery box of the right size and hinge the cover to the top, placing a knob on the other edge. Make a support for this closet by driving two strips of wood into the ground and screwing two crosswise strips of board to the tops. Lay the grocery box on its side on these supports and nail it to them from the inside. Here anything hot can be placed to cool quickly, and with the cover down there will be no danger from cats or dogs or hens. If desired to give a freer access to the cold air, several holes can be bored in each end and in the bottom before putting the box in position on the supports. If the ground is frozen too hard to insert the strips of board, the closet can be placed against the side of the house, close to the kitchen door, and supported in place by two wooden brackets. Another plan to secure the same result would be to make the closet and screw a wooden handle to the middle of the top, with holes bored in ends and back. When it is to be used put the dish, or dishes, inside and set the closet out onto the snow beside the door. Take two large boxes, one 2 inches smaller than the other every way, and bore two 1-inch holes in the bottom of each box for drainage. Fill up 2 inches in the large box with powdered charcoal or coal ashes. Put the smaller box inside and fill the space all around with the charcoal or ashes. Fix the lids to both boxes to fit tightly. Put shelves on both sides of inner box. Leave a place in the center of the box for ice. A rack, made of lath, can be laid at the bottom for ice to rest on. The accompanying picture shows how a well may be utilized during the warm months for cooling butter, milk and other perishable articles. It will be found very handy as a substitute for a refrigerator when the farmer has no ice supply. 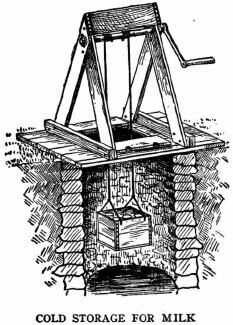 Anyone can make a triangular-shaped frame for the windlass, which is placed above the well; and anyone can also put the trap doors in the platform of the well. These doors should be provided with a lock, so children cannot fall in. A pin may be placed on the handle side of the windlass to prevent the crank from turning around when the box is lowered to the desired depth. The picture is only suggestive. The shape and size of the various parts will depend upon the style of the well. Preferably, the box should be made of galvanized iron and have perforations in the bottom, so it may be lowered right into the water. Of course, this would not be feasible if the materials to be kept cold were not first placed in sealed receptacles. 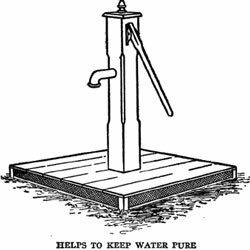 Where a well with a bucket pump or the ordinary wooden pump is the only available place to put such a cooler, the cooler may be at one side of the well. If necessary, the position of the pump may be shifted. But now my task is smoothly done, I can fly, or I can run. Here is a way to keep the well clean and pure at all times. Make the frame of the platform of 2 x 4's, allowing a space 2 to 6 inches between the top and bottom parts of the sides. This space is covered on the inside with a fly screen to keep out dirt and insects, and outside of this with a larger meshed screen to keep out large vermin. This gives good ventilation to the well, which never becomes foul. In the winter cover the platform with straw and snow. To remove floating litter from a well, take an ordinary sand sieve, and, after marking off the rim into three parts, attach a wire to any of the two points and to this improvised handle attach a rope. Fasten the end of the rope to the third point in the rim and a weight to the sieve, so that it can be lowered into the well and will sink. When used, sink the sieve edgewise into the water and pull the rope with a single attachment and it may be lifted out with all the floating sticks and timber on the surface of the water. This sketch shows an arrangement for making use of the dog for carrying water. It simply consists of a wheel 8 feet in diameter and 18 inches wide, with room enough inside for the dog to walk around, where he acts as a tread power, which causes the pump to revolve. In southern California there are a number of these dog-power pumps, which cost less than $15. A good-sized dog can easily earn his living in an arrangement of this kind. The problem of keeping water in a cistern clean is most easily solved by not allowing it to get dirty, as can be done by the device shown in the drawing. 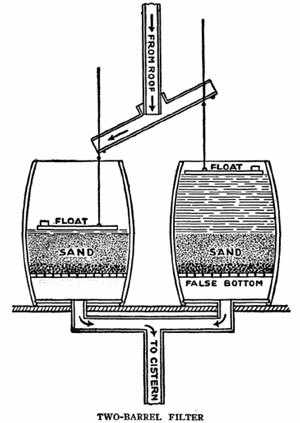 Two barrels, each with a perforated false bottom, are set side by side beneath the water spout from the roof and connected with a pipe leading to the cistern. Above the false bottoms fine gravel and then sand are packed to the depth of 8 or more inches. On top of the sand rest stout floats as large as can be let down into the barrels. From near the margin of the floats two heavy wires extend vertically upward about 2 feet to engage loosely near their centers with a tilting spout by means of knobs on both the ends of the spout and the wires. When the barrels are empty the floats rest on the sand. 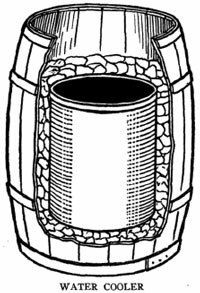 As the water begins to pour in one barrel it strikes the float, but is prevented from gouging a very deep hole at the outside of the barrel by striking a strip of wood about 1 inch high, 2 inches wide and 1 foot long. This spreads the flow. A layer of gravel at this place would also help prevent gouging. If the flow is too great to filter away readily, the float will rise and the knob on the wire will engage with the spout, which will be tilted until the flow will suddenly start into the other barrel. If the delivery pipe to the cistern be large enough there should be no danger of either barrel overflowing. When the sand becomes dirty a few minutes will serve to remove it and put in fresh. This will insure clean water in the cistern, and greatly reduce the number of times the disagreeable job of cleaning out the cistern must be done. Nearly every farm can boast of good water, but no water, either from well, spring or stream, is pure, as it all contains more or less animal or vegetable matter. The only way to make it pure is to filter it, just as is done in city supply reservoirs, or private filtering tanks. A simple water filter is very easily made that answers all purposes for domestic use. The plan of its operations is identical with that employed in large reservoirs where water is filtered on a large scale for general distribution. This filter consists, primarily, of two flower pots, set one above the other. In the bottom of the upper pot is stuffed a large sponge. A sponge is also stuffed in the bottom of the lower pot, but it is more adequately supplied with filtering material by placing above the sponge a layer of smooth pebbles, then a layer of coarse sand, and still above this a layer of pounded charcoal 3 or 4 inches in depth. It is also best to place another layer of smooth pebbles above the charcoal, to prevent it from being stirred up during the circulation of the water. 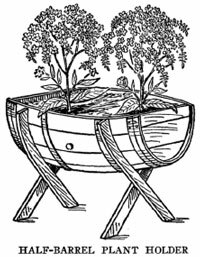 The upper pot should be the largest, and if the lower one is strong, the upper one may stand in it, or two strips of wood will serve as a base support. The two pots thus arranged are placed on a three-legged stool with a hole in it, through which the water drips through the bottom of the lower pot into the mouth of a jug set underneath. The upper pot serves as a reservoir, and its sponge stops the coarser impurities, and thus the filtering layers of the lower one may be used for a year without being renewed, though it is necessary frequently to clean the sponge of the upper pot. The layers of sand and charcoal of the lower pot are positively effective in stopping all animal and vegetable matter, as well as many smaller impurities in the water. The only trouble one may experience with it is in neglecting the upper sponge for too long a time, or in stuffing it in too loosely, thus allowing the water to pass from the upper pot faster than it can filter through the lower one. Only a little attention, once or twice a month, is sufficient to keep this simple filter in perfect running order. Where the house stands some distance back from the highway a trolley can be rigged up to save steps in getting the mail. The box is hung on two pulley door hangers, as shown in cut. A strong post, with a bent arm, is set next the highway, a, suspended between it and the house, on which the box runs. 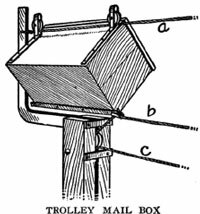 A pulley is fastened in or to, the post, and over it runs a cord, b, c, to pull the box back and forth between the house and the road. The box is sent down to meet the carrier, who places the mail in it, and then it is quickly pulled back to the house. A very nice ornamentation for the lawn is shown in the picture. It is made by sawing an oil barrel in two as shown, and mounting it on legs. Paint it and set one-half of the barrel on each side of the walk and use them for growing flowers in during the summer. Care should be taken to have the hoops thoroughly nailed to the staves and to have the heads solid. Dark green or dark red are good colors for the painting. If preferred, the barrel may rest upon the ground, but should be securely braced or blocked to prevent rolling. Instead of keeping the vegetables in barrels or boxes scattered all over the cellar, have a set of storage bins. Take six drygoods boxes and bolt them together as shown in the drawing. Put legs on them to hold them off the floor and a cover on the top. Then paint on the boxes the names of the vegetables. 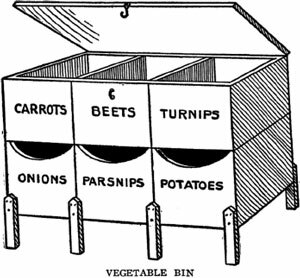 It is most convenient to have the vegetables most frequently used in the upper boxes, which would not be true of the bin shown in the picture. If the upper row of boxes is attached to each other, but not to the lower ones, the top section can easily be moved enough to make filling the lower boxes a simple matter. Otherwise, the vegetables would have to be put in through the openings at the top of each box a few at a time by hand, instead of pouring them in. Many people would not care to keep their potatoes in such a sectional bin, preferring a large separate bin. It certainly is all right for other root vegetables, and many other products of the farm that are stored might well be kept handy for use in such a labeled sectional bin. A temporary cellar is sometimes necessary in cold countries where that under the house is not sufficient for storing vegetables. 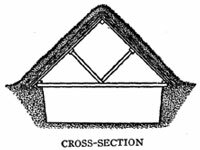 A very effective and useful temporary cellar may be constructed after the following method, as shown by the drawings: Dig a pit 15 feet long, 10 feet wide, 4 feet deep in a solid, dry place where the drainage is good. Put a gable roof of 1-inch board over the hole, supported by 2 x 4-inch strips at the eaves, gable and half-way up the sides. Strengthen by crossbeams and a central support if the lumber is not first class. Over this place 8 to 10 inches of dry straw well packed and over the entire structure, excepting one end, pack earth 12 to 14 inches deep. The surface should be smooth to shed water. It is better if plastered with mud covered with sods. The door end must be double-walled and the space filled with straw. The door must also be double and its margin packed with cloth strips, so as to be practically airtight. If possible, the pit should be drained by a tile, the end of which is covered with a piece of wire netting to prevent the entrance of rodents. Such a cellar will prevent freezing during usual winter weather. The door should be opened on mild days and the interior aired thoroughly. The size and depth of the pit may be varied according to needs. Heavy posts should be set for the ends, 3 feet in and 3 feet out of the ground. It is not necessary for the center post to be as heavy as the end ones. Have the posts clean and smooth, so they will not soil the clothes when blown against them. Take a piece of 2 x 4-inch hard wood 5 feet long for the lever. Fasten to the post near the top with a 3/4-inch bolt, 2 feet next to the line and 3 feet for the lever. A block holds the lever in position while the clothes are being put on. A button holds the lever upright when the line is hoisted. There is no little thing that will save the household so much as a revolving clothes horse, so near the back stoop that the clothes may be hung on it without stepping out in the snow. A solid post should have a hole bored in the top and the arms may be beveled and spiked to a piece of plank through which a bolt passes into the post, or each arm may be bored to let the bolt pass through it. Three, four or five arms may be used as desired, and of any length, provided all are of one length. No skill is required in making it, as the rope holds the arms up simply by being tight enough. It is well to set the post before measuring for the arms, so that they may be sure to reach the veranda. Some laths may be nailed together at first to make a model, if you are not sure of your ability as a carpenter. A small closet in a home, for keeping medicines and toilet articles, is a great convenience. One consists of 1/2-inch pine, 4 inches wide, planed and put together so as to be 2 x 3 feet. It has four shelves. The door is of thin pine, free from knots, planed, hinged and with a back catch. The outside of frame and door is varnished. Being in the toilet room, it is indeed a very useful as well as ornamental piece of furniture. It has no back casing or boards; simply rests against the wall. It is held in place by four short pieces of band iron, one end of each band being fastened to back of frame, the other end fastened to the wall by a screw. All kinds of medicines, shaving materials, soaps, wash rags, can there be kept. If there is no other looking-glass in the room, one may be fastened on the outside of door. A handy cellar shelf that will save the housekeeper many steps may be arranged at the side of the cellar stairs, within easy reach upon descending a few steps. The shelf is contrived from an old axle and wheel. The axle is fastened to hang from the nearest beam to the stairway. The wheel is covered with thin, smoothly planed boards and the axle is kept well oiled, so the wheel will revolve readily, bringing all parts of the shelf within reach at need. Farmers can have running water, hot or cold, in their dwelling houses at a cost of fifty dollars and up, depending upon the size of the house and the kind of equipment needed. This makes possible the bath and toilet room, protection from fire, the easy washing of windows and walks, the sprinkling of lawns, the irrigating of gardens, and all the other conveniences which a few years ago were thought possible only in cities, where big water systems were available. This is one of the things that makes farm life attractive. It lessens the work in the house, insures a fine lawn and garden, reduces danger from fire, adds greatly to comfort and convenience in every direction. The way to secure this is to install a water supply system, with a pressure tank in the basement. This pressure tank is so arranged that by pumping it full under strong air pressure the water is forced all over the house, and is available for the bathroom, toilet room and the garden or fire hose. The water is distributed about the house exactly as it is in city homes, by means of galvanized iron pipes. Where a small building is to be supplied and the amount of water to be used is not large, the system can be installed for $50. For the average house $90 is a better figure. 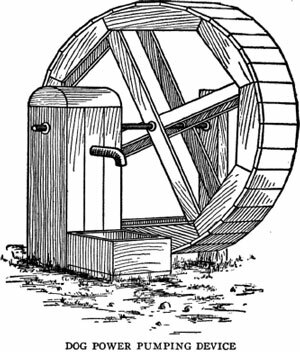 Where the house is large, and where considerable amounts of water are needed for the lawn and garden, and possibly also for washing carriages, automobiles and horses, a larger system should be installed, costing up to $150. Its installation is easy, and its operation is exceedingly simple. Any pipe fitter or plumber can put in the plant so that it will work perfectly. All that is needed for operating is to keep the tank pressure up to the desired point. This may be 20, 40, 60 or 100 pounds. A few strokes of the pump, if the work is done by hand, is sufficient. If a lot of water is used, of course the amount of pumping will increase. By being economical in the use of water, that is to say, wasting none, this matter of pumping is not at all a serious problem. The most satisfactory method of pumping, however, is to use a windmill, or what is much better, a gasoline engine. Every up-to-date farm ought to have a small gasoline engine, which can be utilized not only for operating this water supply system, but for churning, sawing wood, cutting feed and doing a dozen and one other jobs about the farm. It would take only a few minutes of pumping to raise the pressure in the tank the desired height. With the engine it will not be necessary to be economical in using water, provided the well is a good one, and the supply of water large. C. A. Shamel of Illinois, editor of the Orange Judd Farmer, has a system of this kind in his country home. It cost $75. He put in a bathroom, a toilet, has a hot water tank in connection with the kitchen range, and no money ever expended on that farm has given anything like the amount of satisfaction and comfort as that paid for this water supply system. Arrangement is made to take care of the waste water and sewage by running a large tile from the bathroom, one-quarter of a mile distant, to a large cistern, located in the center of a big field. This is disinfected about twice a year, and is easily handled. There is never any trouble with the water pipes, even during the coldest weather. Neither has there been any difficulty with the waste system. In fact, the water supply is practically perfect, and the people on that farm don't see how any farmer who can get together $75 or $100 can afford to be without it. Up to date all the pumping has been done by hand. With the pump in perfect condition, this is not a laborious problem. On two occasions the pump valve became slightly defective through wear, and it was not convenient to fix it for a few weeks, being somewhat distant from the factory. With this condition it required a great deal more labor to do the pumping, but even with this disadvantage, it was not a serious proposition. 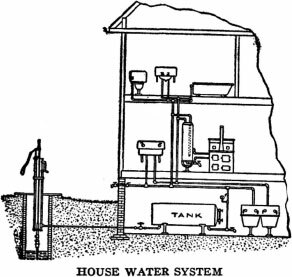 The illustration indicates the arrangement of a water supply system, and, as can be readily seen, it is very simple. Notice the hand force pump tank in the basement to hold the water under pressure, and the arrangement of lavatories, bath and kitchen hot water service. The system can also be used for supplying water to stock tanks, and these may be located anywhere on the farm. The pressure developed in the tank is sufficient to force the water anywhere wanted. This use will, of course, depend entirely upon the wishes of the owner and is simply a matter of cost of pipes. It can very readily be used for delivering water to dairy or other stock barns, where it can be run into water troughs in the stalls, or elsewhere, as desired. A handy device that will give an alarm in case the roof catches fire close to the chimney is shown. 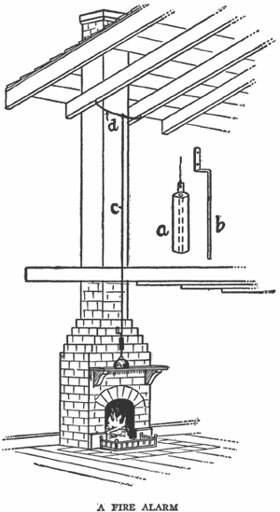 Drive a nail in two rafters on a line with the face of the chimney, to which stretch a cord close to the chimney, so that, in case of fire, the cord will burn off and release the weight hanging to it, which in turn will drop on an electric button and ring a bell. A dry battery will cost 20 cents and a bell 50 cents. Place these on a shelf above the fireplace. Place a piece of heavy wire, b, 10 inches long, as shown, and fasten to the wall or chimney for the weight, a, to slide on. The weight need be suspended only an inch or two above the bell. A necessity on all farms and near all farm buildings are ladders and other means of getting on the roofs, and in and out of upper story windows in time of emergency. A scuttle should be left or made in the highest part of the house roof and a ladder should be at hand that will reach the eaves of the highest roof. A good place to store a ladder of this kind is under the eaves of the L or along the rear wall of the house. Have two hooks to hang it on. Make a good ladder and keep it painted. If your cellar is dark, there is danger of accidents when going down the stairs. Have the last step whitened so that you may easily know when you are at the bottom. You can see this step plainly even in a dim light.